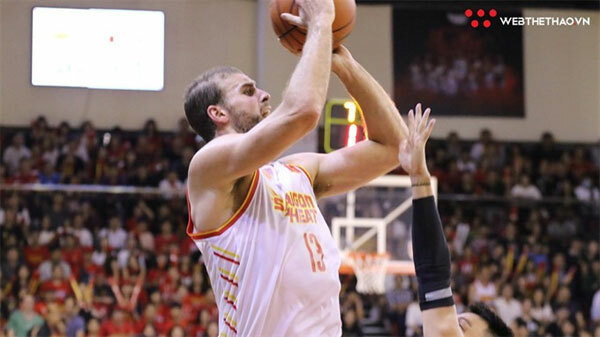 VietNamNet Bridge – Saigon Heat lost to Singapore Slingers 70-76 at the ASEAN Basketball League in Singapore yesterday. With the support of their home fans at the OCBC Arena, the Slingers quickly powered in front in the opening exchanges. But the Heat hit back, thanks to the efforts of Trevon Hughes, who scored four points, Murphy Burnatowski (five points) and Chris Dierker (five points), to narrow the gap. However, Delvin Goh shone in the last minutes to help the hosts lead 24-19 at the end of the first quarter. The hosts continued to dominate the second quarter leading 47-24 at the break. The Heat fought back strongly in the next session, Trevon Hughes made three-point throws to help the Heat narrow the distance to just seven points, 69-62. As the clock ticked, Heat captain Murphy Burnatowski was forced to leave the game because of fouls. Although losing, Chris Dierker of the Heat still won the player of the game award with 16 points, seven rebounds, two assists, four steals and two blocks. The Heat will next face Formosa Dreamers of Chinese Taipei on February 16.